The mighty Titans were a powerful race that ruled the world before Olympians, in a time of the Golden Age of man. They were immortal giants of incredible strength and knowledge of old religion rituals and magic. They are also known as the Elder Gods and their dwelling place was at Mount Othrys. In Greek culture they were interpreted as personifications of the Earth (Gaea) and the Sky or Heavens (Uranus). The first generation of Titans were the direct descendants of Gaea and Uranus who originally gave birth to Twelve Titans, six males and six females. The six males were Coeus, Cronus, Crius, Hyperion, Iapetus and Oceanus and the females were Mnemosyne, Phoebe, Rhea, Theia, Themis and Tethys. 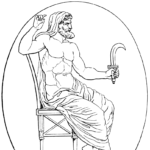 They arose to power when Cronus, in a plot with his mother and his brothers, castrated his father Uranus and took the rulership of Cosmos from him. During this reign, some brothers and sisters consorted with each other while others consorted with sons and daughters of their relatives and gave birth to the second generation of Titans. Hyperion and Theia gave birth to Eos, Helios and Selene, while Coeus and Phoebe brought forth Leto and Asteria. Oceanus and Tethys gave birth to Oceanids and Potamoi who are in general not referred as Titans. However, an Oceanid Clymene, a daughter of Oceanus and Tethys, helped Iapetus to continue the next generation and bore him Atlas, Prometheus, Epimetheus and Menoetius. 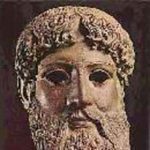 Crius and his half-sister Eurybia, a daughter of Gaea and Pontus, brought forth Astraeus, Pallas and Perses and, eventually, Cronus and Rhea gave birth to younger gods, Zeus, Hades, Poseidon, Hera, Hestia and Demeter who rebelled against Cronus and his followers and later defeated them in a ten-year war, known as Titanomachy. 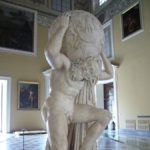 Atlas was a Titan who was responsible for bearing the weight of the heavens on his shoulders, a punishment bestowed on him by Zeus. Atlas was given this task in retribution for him leading the Titans into battle, or Titanomachy, against the Olympian Gods for control of the heavens. 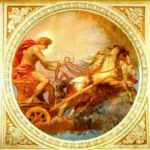 Coeus is the Titan God of the North, and the Titan of Resolve and Intelligence as well as the embodiment of the celestial axis around which the heavens revolve. Hyperion is the god of light, he is the son of Uranus and Gaea. 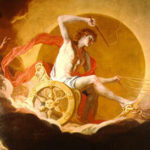 Hyperion in turn is the father of the sun, Helios; the moon, Selene and the dawn, Eos. His wife was Thea, who was also a Titan and the goddess of sight and the blue of the sky. 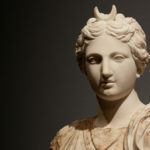 Selene, goddess of the moon, truly represented the moon itself to the Greeks. Selene is a Titan goddess. Titan gods and goddesses were actually the divine beings that preceded the Olympian gods and goddesses. The first of these divine beings emerged from the primordial and originally called Gaea mother and Uranus father.